I know you're excited about Thanksgiving. It's okay... I've been anticipating it for weeks now because let's face it, it's the foodie holiday of the year! That's why I jumped in once Halloween was over to fully indulge in all things Thanksgiving. 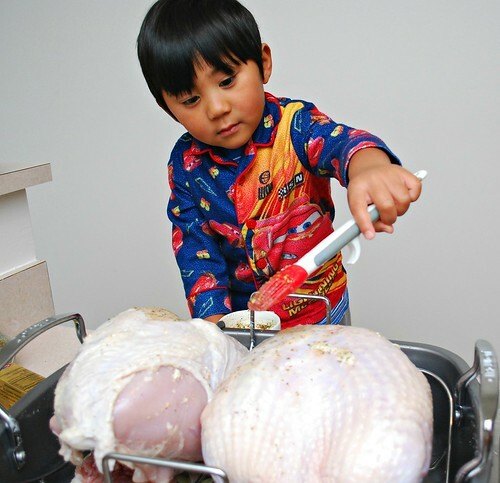 Have you got your tools ready to make this a memorable Thanksgiving holiday? I recently partnered up with friends from Plugra Butter to help make my holiday even tastier so stay tuned for some deliciously buttery recipes starting now and through the next year. They are my ultimate butter choice and it really is a staple in my kitchen! 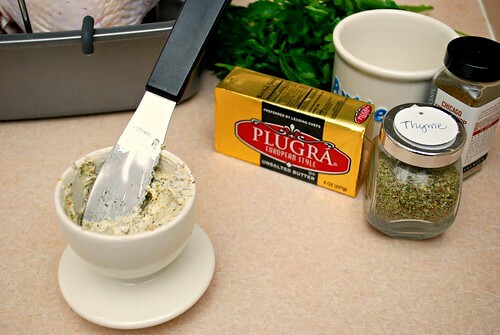 For this Herb Butter Roasted Turkey Breasts recipe, I used softened Plugra butter with a blend of fresh and dry herbs as well as some seasonings to really impart some flavor into my turkey. Another point to make is that roasting your turkey breasts should be done accordingly. This is best made in a roasting pan with a roasting rack. Doing so allows for the natural juices to be saved along with catching any melted herb butter. Together, they can create one amazing gravy so be sure to use a roasting pan with rack. The one I used is from Circulon. I love how lightweight it is and so easy to clean because it's non stick. It's a great size too since I was able to fit two 8+ pound turkey breasts on it comfortably. The Circulon Nonstick Bakeware 17-Inch by 13-Inch Roaster with U-Rack makes it simple to create healthy, lean and mouthwatering dishes, from a maple-and-cider-brined turkey to a pork loin roast with cranberry chorizo stuffing. 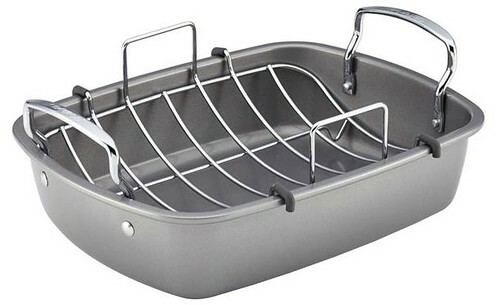 With its convenient chrome-plated U-shaped rack, this roaster keeps meats off the bottom of the pan so unwanted fats drip away to the bottom of the roaster. The heavy-duty carbon steel construction promotes balanced heat distribution for superior cooking performance and long-lasting durability while the rolled edges provide extra strength. The roaster also features DuPont® Autograph® nonstick for excellent food release and easy cleanup. 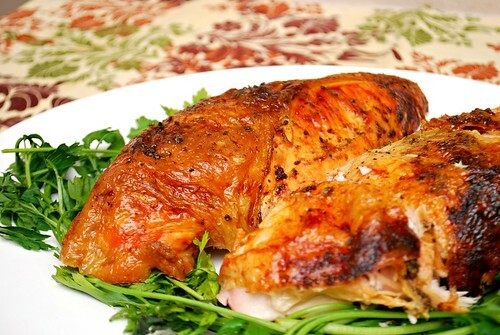 Oven safe to 450°F, this well-proportioned roaster is a great way to create healthier, more delicious meals. Crafted with elegant contemporary design and ready to deliver even more healthy cooking solutions, the roaster coordinates well with many other items in the Circulon Bakeware collection. Another tool I would recommend this holiday season is the Thermoworks ChefAlarm. If you're a fan of their Thermapen, oh boy... this is going to excite you even more! I used this to check the temp of my turkey so that I could ensure it was cooked perfectly and it wouldn't come out too dry or not cooked enough. It's versatile so that you can check the temperature of both hot and cold (from turkeys, roasts and grilled items... to even yogurts, ice creams, and the like. It's perfect for both commercial kitchens (which I use in some of the classes I teach) and at home too. Designed for commercial use, ChefAlarm delivers features not found in "houseware" cooking alarms. Continuous Min/Max display tells you how hot (or cold) your food got when you weren't looking. A "High Alarm" sounds when your food reaches your setting, and a first-of-its-kind "Low Alarm" is perfect for making yogurt and other cold dishes. Adjustable alarm volume can be heard in a noisy restaurant kitchen. The main temperature digits are big and easy-to-see from a distance. Touch the backlight button to read the display in the dark. New from the factory, ChefAlarm reads within ±2°F so you should never need a calibration adjustment but the CAL feature can be used for fine-tuning your accuracy to better than ±1°F. Fold ChefAlarm flat and use the magnetic back on a metal surface or tilt the display up and use it on a counter. Only ThermoWorks offers the new Pro-Series Temperature Probes. Built for robust commercial use, they are more accurate, faster and more moisture-resistant than any other alarm probes. ChefAlarm comes with one Pro-Series High Temp Cooking Probe that measures to 572°F with a cable that withstands 700°F short term exposure. Coupled with a molded transition to the S.S. tube, this probe survives commercial cooking use longer than consumer probes. Replacements are still affordable. The optional Pro-Series Mini-Needle probe is a true innovation and is suitable for thin or tiny portions as well as Sous Vide cooking where the probe and cable are immersed. It reads in only 5 seconds so its great for spot checks too. Every kitchen should have at least one ChefAlarm. Preheat oven to 325 degrees. Have your roaster and rack ready. Prepare your turkey by rinsing and patting dry. Place turkeys breast side up on roaster rack. Set aside. In a bowl combine the softened butter and 1 tablespoon of each spice and herbs, mixing well. 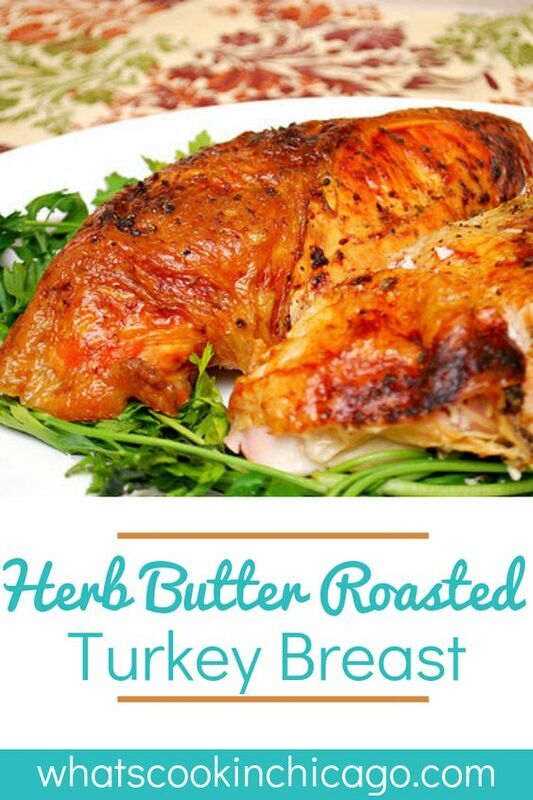 Using your hands, tuck in between the skin and flesh of the turkey breasts all around. In the same bowl, combine the melted butter, vegetable oil and remaining spices and herbs, mixing well. Using a pastry brush, paint the outside of each turkey breast with the mixture. Transfer turkey breasts into the preheated oven and roast uncovered for 4 hours or 4 hours 15 minutes, or as directed on your packaging for your size bird. Remove from oven and allow to rest for 30 minutes before carving. I love watching Joel help you in the kitchen. @Isabel - please read carefully... roast uncovered for 4hrs or up to 4hrs & 15mins or as directed on your packaging for your size bird... not 8 hours. What is the oil measurement? It just says 1/2 vegetable oil.